U Wisara is a main thoroughfare that is part of the key north-south traffic flow in Yangon. It is a four lane road with a broad treed median. Pyay is another north-south road and Pyay is another story altogether. My street, San Kone Lane or Road or Street, all seem to work, runs between U Wisara and Pyay. The van that shuttles me and other NAG workers to and from work picks me up at U Wisara. The timing is somewhere between 8:00 and 8:30, but if the traffic is bad, it could be later. I am getting to know my corner of U Wisara and San Kone quite well. There are fellow workers waiting to be picked up by their, what is referred to in Burmese English as, ferries. And some people are discharged for the big business centre across the street. Mostly vans, but there is a bank that runs a small bus. Factories run small trucks with benches along the truck bed. 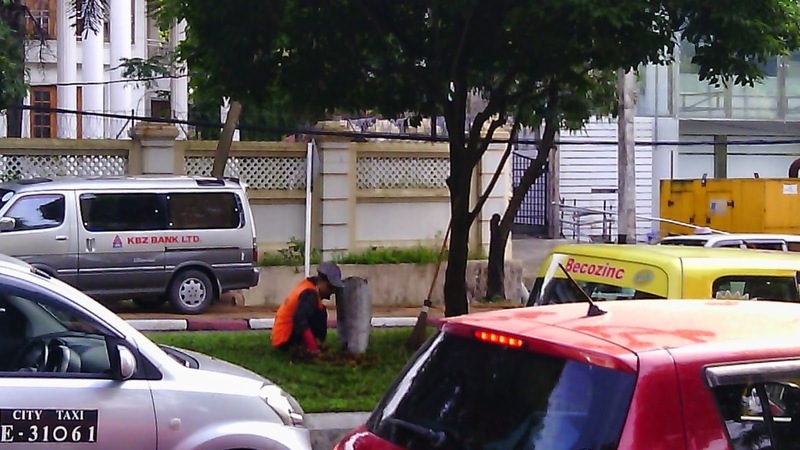 One intriguing aspect of U Wisara is the young woman who regularly sweeps the median, which is covered with a kind of broad-leaved grass. She has a kind of corn broom, an old cement bag on a string around her shoulder and a light blue dustpan to pick up the detritus. She has a bright orange safety vest, which identifies her in my mind as a municipal worker. Her yield is low, just some twigs and a few leaves from the trees on the median. The intrigue lies in the why. Yangon is a clean city compared to New Delhi and Calcutta, but garbage is never far from sight. Littering is almost inevitable in the absence of garbage cans. And many streets, but not U Wisara, are informal places of business with small sidewalk cafes and vendors of this, that, and other things. Part of the answer lies, I think, in what I observed in an older women who came out of a gate onto U Wisara yesterday. She made a small gesture of worship towards Swedagon Pagoda, which can be seen at the end of U Wisara. It was like the genuflection of believers crossing in front of an altar in a Catholic church. My street sweeper companion is a secular nod to the divine in a city full of monks. Goed dat je de tijd krijgt om dit soort observaties te kunnen doen! Geeft aan dat het tempo bepaalt wordt door omstandigheden en niet door jou alleen! Dat geeft een gevoel van rust neem ik aan en het laat de betrekkelijkheid zien van onze eigen 'haast' cultuur. De dingen gaan zo als ze gaan en de afhankelijkheid van het "openbaar' of 'collectief" vervoer hebben zo hun charme, want anders had je de detals van het straatleven en schoonmaaktechnieken op de middenberm nooit zo kunnen waarnemen en beleven! Geniet van het niet westerse!